Thanks to Dr. Matthew Wasco, St. Joseph Mercy Hospital, Ann Arbor, Michigan (USA) for contributing this case. To contribute a Case of the Week, follow the guidelines on our Case of the Week page. 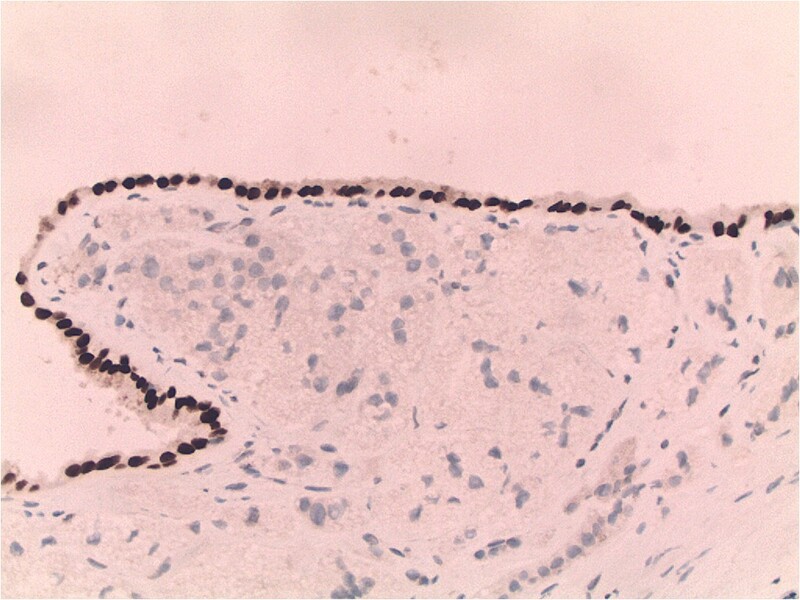 As the leader of Rabbit Monoclonal Antibody (RabMAb�) technology, Epitomics is pleased to introduce EP Clones�, a new class of high quality antibodies for anatomic pathology. 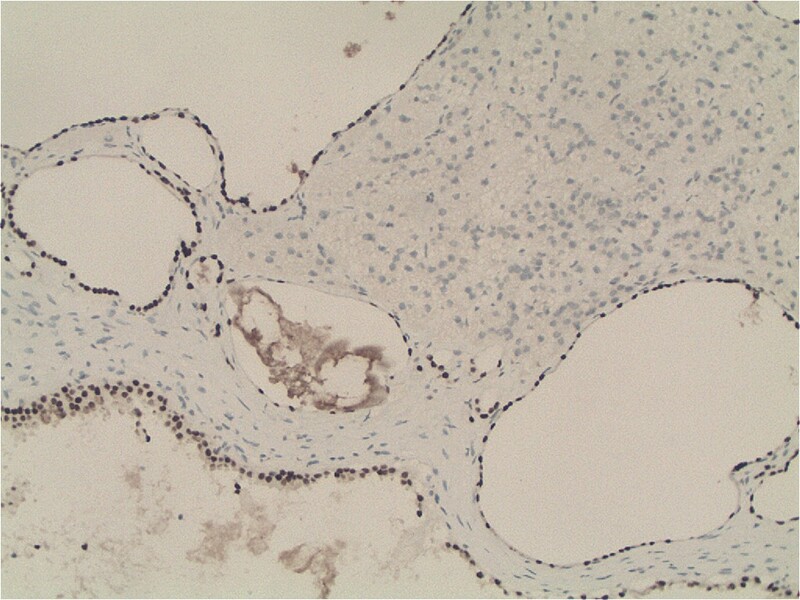 Using Epitomics� patented technology, combining the high specificity of monoclonal antibodies with high affinity of rabbit antibodies, a group of RabMAbs were generated against popular and well-known pathology targets (e.g. Her2, ER, PR, Ki-67, CD Markers). Fully validated (ASR, IVD labeled), EP clones are ideal for FFPE tissues and shows superior specificity and sensitivity compared to traditional antibody options. For more information contact us at 877-772-2622, IVDinfo@epitomics.com, or visit our website at http://www.epitomics.com/diagnostics. - Dr. Eddie Fridman, The Chaim Sheba Medical Center, Israel, Onchocerciasis for the Skin-nontumor chapter. 2. Would you like to add information to the Thyroid chapter about the new Bethesda system for Thyroid cytopathology? If so, please email your CV to NatPernick@Hotmail.com. 3. Please note that the Home Page topic search only works for the Skin-Melanocytic tumor and Breast-nonmalignant chapters. We have not yet populated the search database for other chapters, but are doing so as we update each chapter. 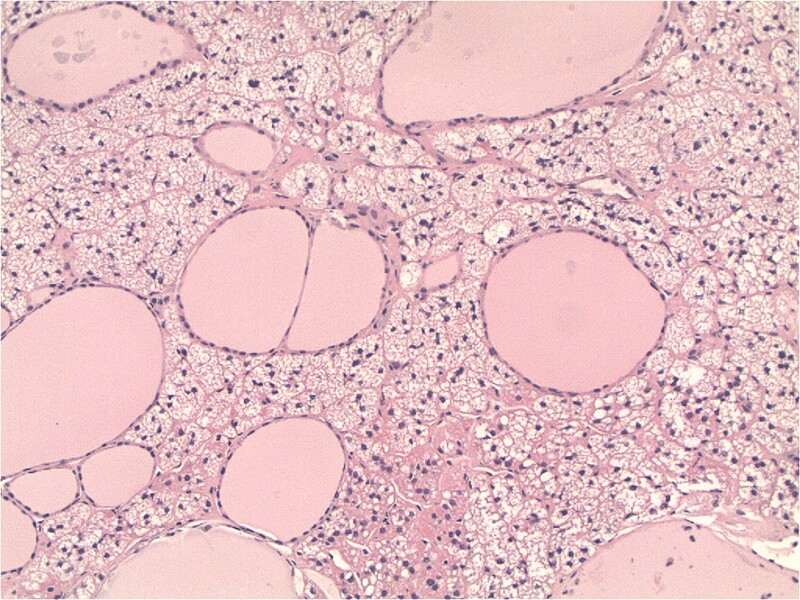 A 61 year old woman presented with an incidental 3 cm cyst in the area of the adrenal/pancreas. At operation, the surgeon felt it arose from the adrenal gland. 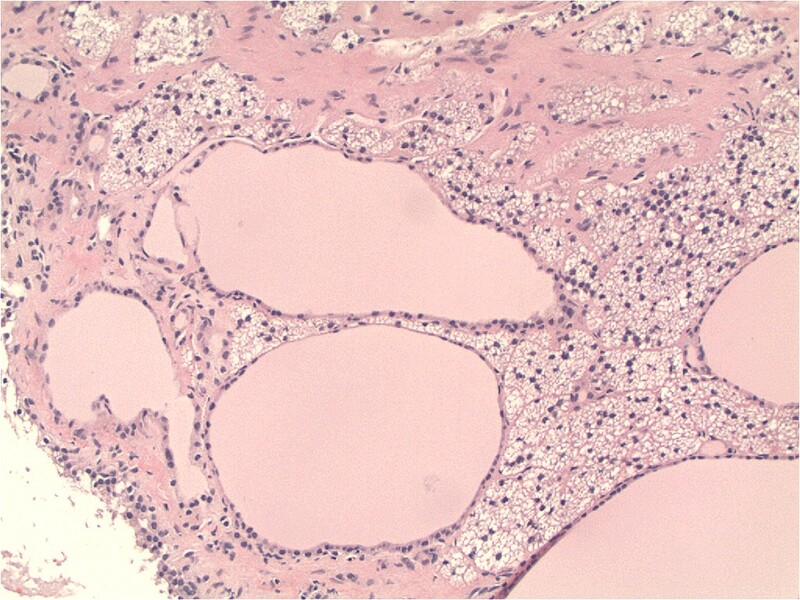 Small cystic structures were also seen admixed in the adrenal and adjacent tissue. 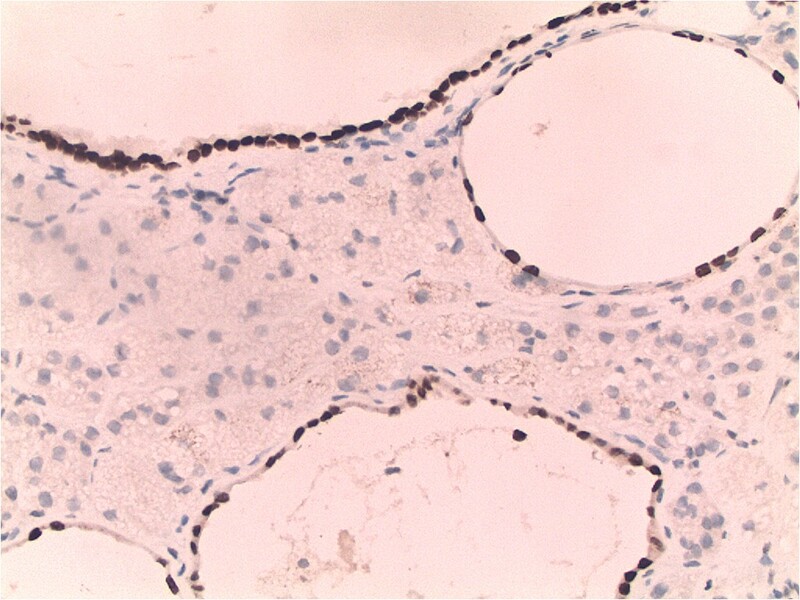 It confirmed that the cystic areas, and the large main cyst, were actually ectopic thyroid tissue, which has been rarely reported in adrenal glands (Surgery 2006;139:580). 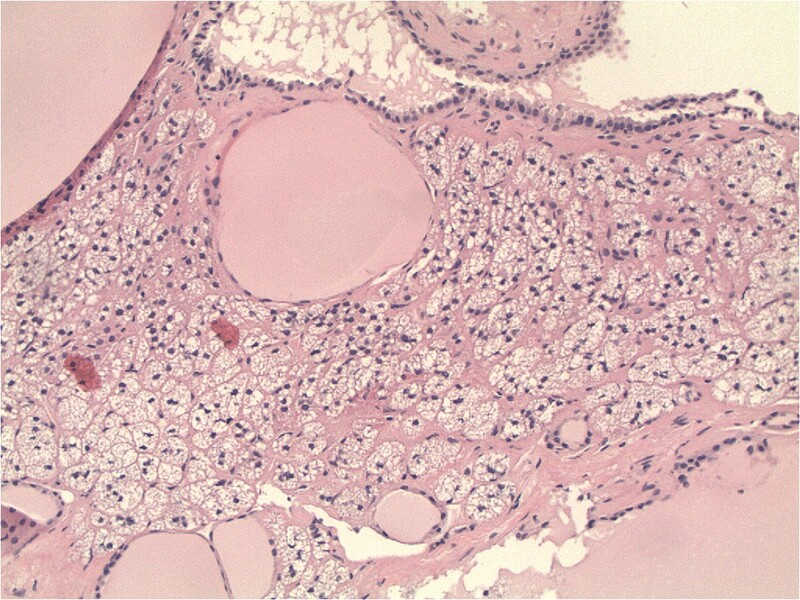 Thyroid tissue initially develops during embryonic week 4 as an epithelial growth on the tongue. By week 7, the thyroid gland descends to the adult position, which is anterior to the trachea. Ectopic thyroid gland is usually found along this pathway, including the region of the neck, mediastinum, pharynx, larynx, esophagus, trachea and around the aorta. The differential diagnosis of adrenal cysts includes epithelial (true) cysts, which may derive from mesothelial structures; hemorrhagic / pseudocysts, which enlarge due to fluid accumulation; lymphangioma and parasitic cysts (PathologyOutlines.com). 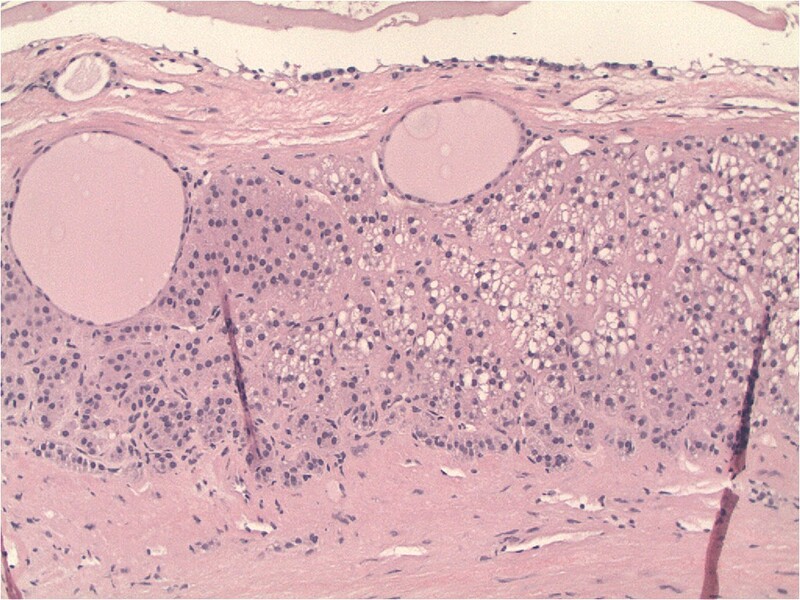 Cysts may be caused by degeneration of an adrenocortical neoplasm, such as cortical adenoma, adenocarcinoma and pheochromocytoma, so they should be examined carefully. 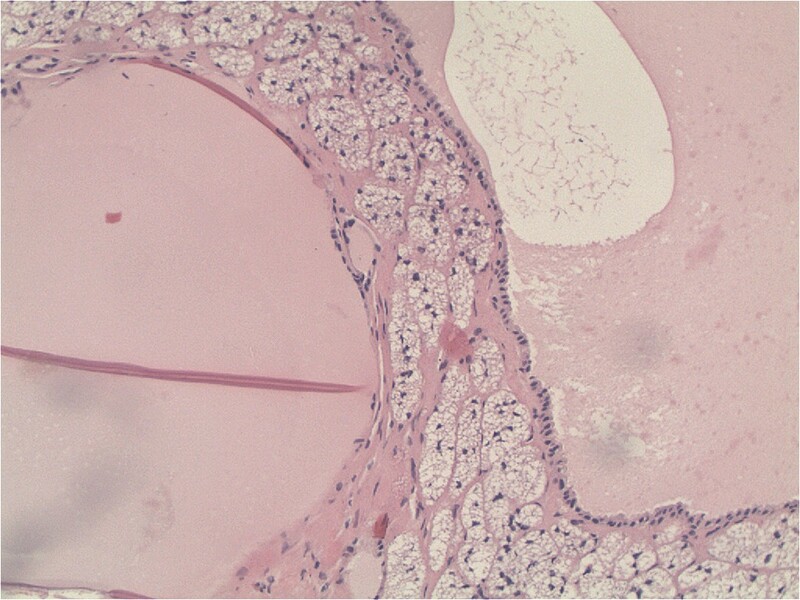 Finally, dermoid cyst has been reported in the adrenal gland (Urol Int 2000;64:104). Histologic examination and TTF-1 immunostains will differentiate these entities. 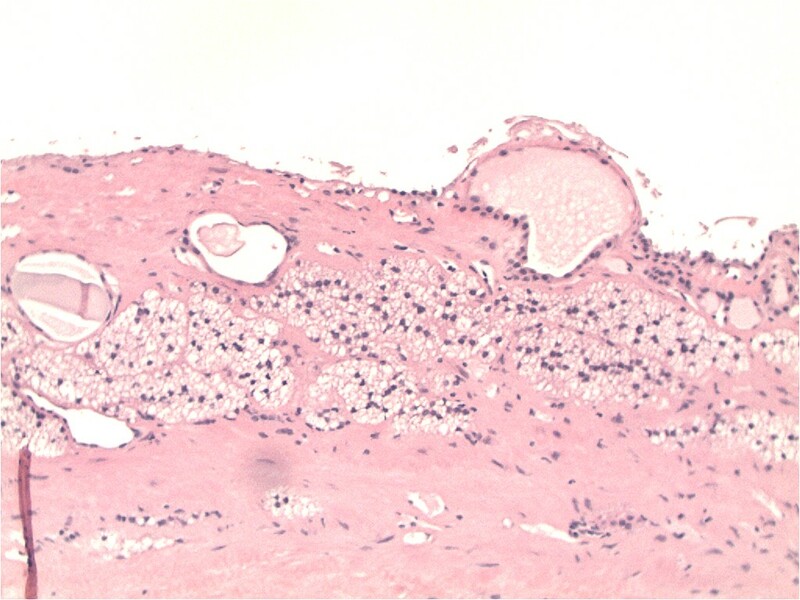 The differential diagnosis also includes metastatic follicular thyroid carcinoma (Hum Pathol 1999;30:105), which may have a dense proliferation of thyroid tissue with vascular invasion and a stromal reaction. There may also be a clinical history. Excision is curative. These lesions do not recur.